All kids love to scribble on blank sheets and mine are no exception! So you can imagine how much of artwork both the boys do in a week when they are given white pages and tons of oil pastels (not to forget the loads of sheets they proudly bring from school too!). All these sheets do end up in a box in the cupboard, but I guess it’s time to send them to their ever proud grandparents, coz I don’t have enough space (!!!) Just curious what do you guys do with them? Keep or bin? So this week I decided to make them a display board for their own artwork which we all can admire a little more before they are put away in a box somewhere and hopefully egg them on. 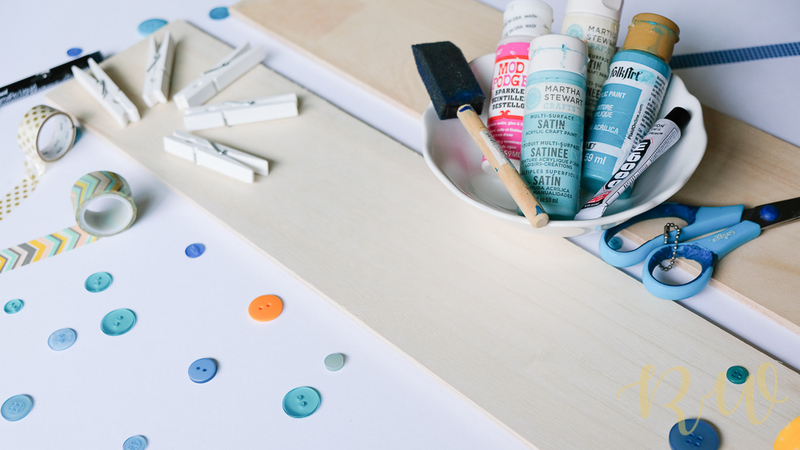 For this DIY, you don’t really need many things, but again, it is very customisable so you can happily add in any decorations to make it as fancy as you want. Displaying the artwork gives the kids a sense of pride and accomplishment when their friends and family come and praise the hard work that went in to it. 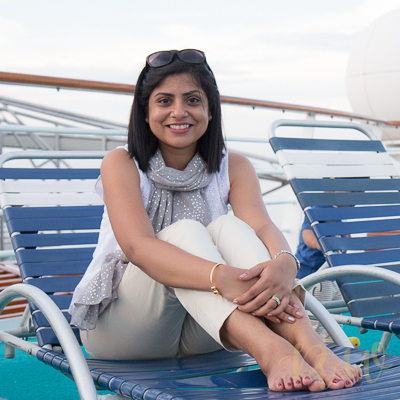 It boosts their confidence and definitely gives them the required encouragement to make more. The more they make, the better they get at it. So a little something like this makes them so happy and the glint in their eyes when appreciated is absolutely priceless! 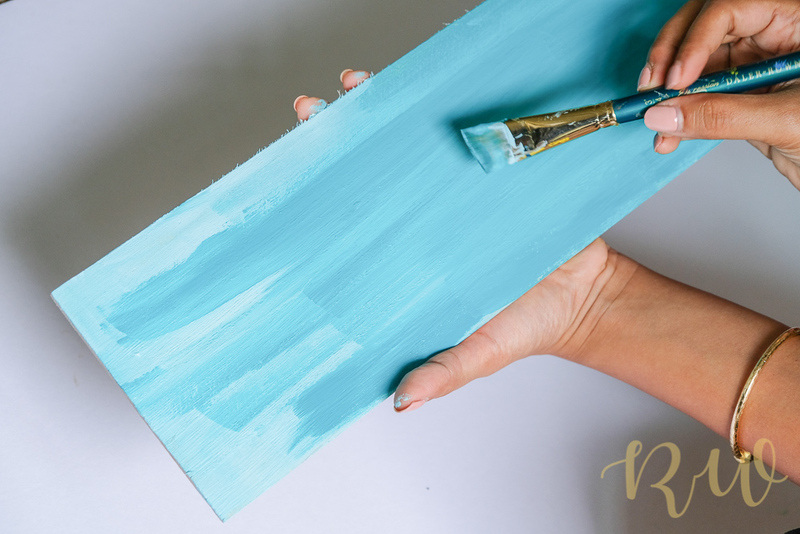 Firstly I painted the wooden board a few coats of acrylic paint of a colour of my choice and let it dry for 20 minutes or so. Then I traced out the words I wanted to write with a pencil before going in with a thick black permanent marker. It’s quite important to measure out the centre and draw a line so that the letters don’t go lopsided or wonky. Once the marker is used, it cannot be erased. Once I was satisfied with the letters I went ahead with the decorations. This was the fun part. I wanted something to make their room look a bit brighter keeping with the teal colour scheme of their room. I had the ribbon, washi tapes and buttons in my stash already, so I didn’t have to buy anything at all except for the two wooden boards. 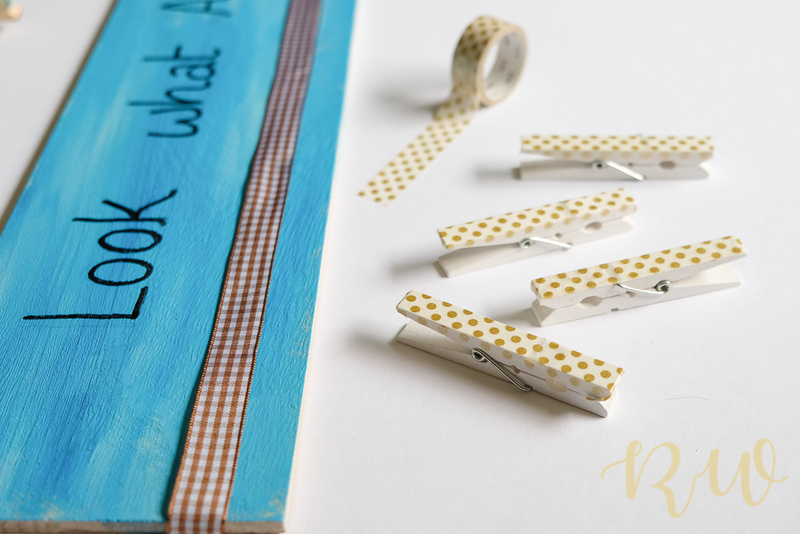 I washi-taped the clothespin also so that they matched the decor, and later glued them to the board. 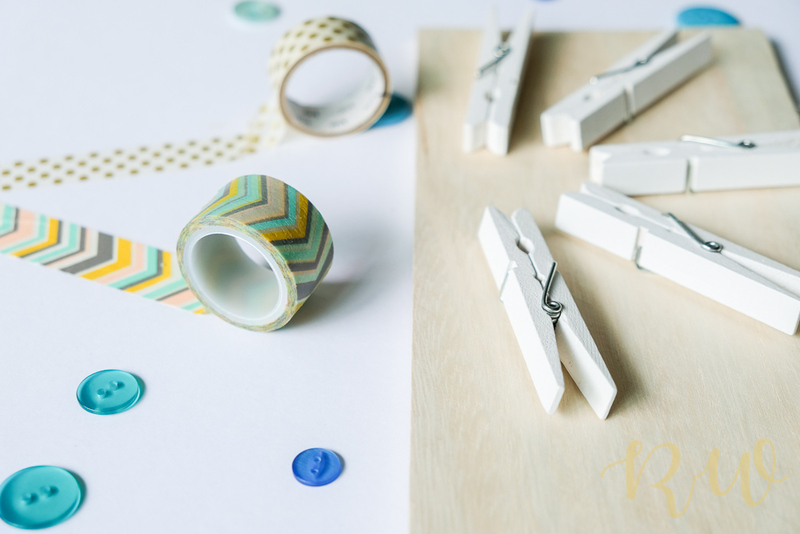 For hanging them on the wall, you can hammer small nails on the two sides of the board and use ribbon or fish-strings to hang. Initially I had thought of using nails but command strips worked just as fine…so as of now, I am going to leave it like that. 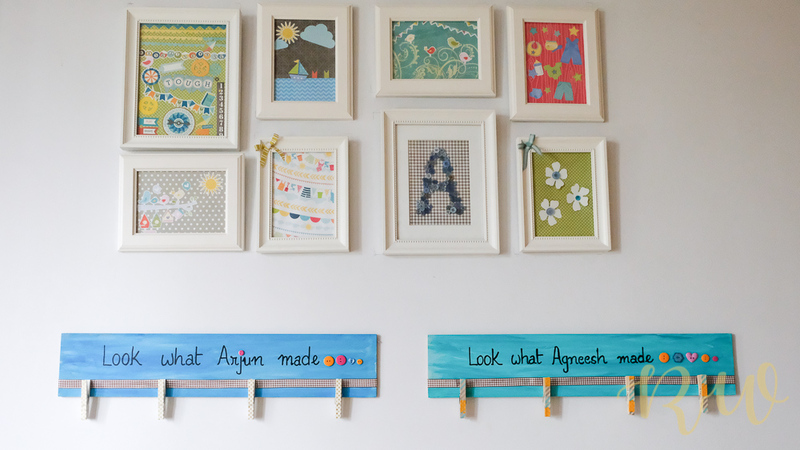 For those wonderful moms who are not much of a DIY-er, you can still create a display area for the numerous drawings and paintings of your little ones…It’s as simple as just tying a length of string/twine across the wall and hang your prints/ artwork with some clothespin…..serves the same purpose but saves on a lot of time. Hope you all liked this simple DIY. Do hashtag me #rheawrites when you make something for your precious ones. Next Post Be Raita Ready! 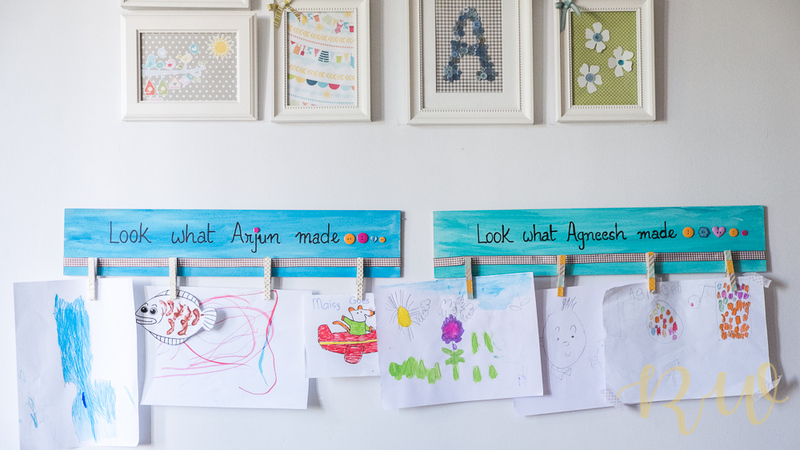 Such a cute and simple diy !l am sure the boys love to see their daily masterpieces hanging proudly. Pity we didn’t get these ideas when our kids wete young ! Your energy and ideas are great ! Such a nice idea of displaying their art works and creativity….. Really I am bowled over by your never ending wonderful ideas….hats off to your energy,spirit and enthusiasm! Thus looks so cool. Very easy too. I am sure kids would love this. Thats an incredible diy idea. 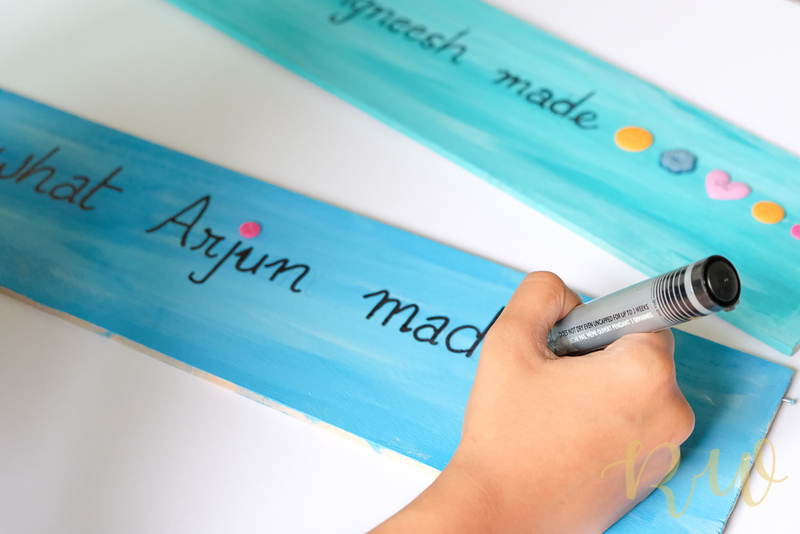 It not only makes the kids more motivated to unleash their creative skills but also makes them realize that as parents we care about what they do. Hi Rhea, I absolutely love this idea. Looks so easy and elegant. I’m totally doing this for our girls’ room. Can’t wait for it now. Just in time. I was looking for some idea to display little one’s art. So simple easy and bright. This is such a nice idea. I would love to give it a try with my daughter. 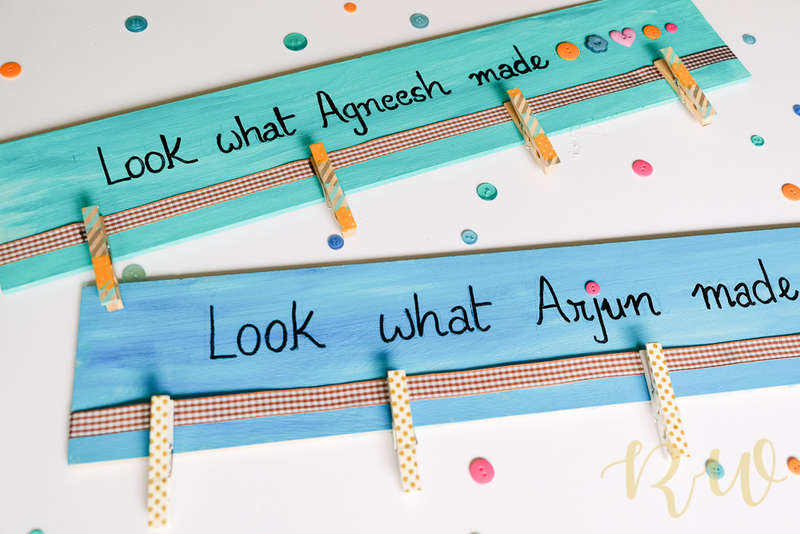 Love these DIY display boards and a wonderful way to make your own creations. Daiso is my saviour for art n craft too.